After using the new devices for a week, what’s most remarkable is that Apple managed to change things up without completely ruining the iPhone’s trademark polish. In fact, let’s get it out of the way right now: The new iPhones are good. Those hints at the future start with the new jet black finish option. I can’t help but think the jet black finish is something we’ll see more of in next year’s iPhone. If you squint hard enough, you can almost see the all-glass OLED design Apple is reportedly planning for the iPhone 8 (or whatever it’ll be called). It’s there in the invisible antenna lines and seamless transition between screen and case. The jet black iPhone looks great when the phone is off. Unfortunately, the new finish scratches easily, and shows fingerprints. Within minutes of having my review unit, it was littered with fingerprints, and within a week, the phone was covered in faint marks. Aesthetics aside, the real changes begin with the home button. Apple has swapped its iconic physical home button for a solid-state sensor. Eschewing the button has a few real-world advantages, like cutting out a wearable part that frequently fails, and helping seal off the chassis so the device is waterproof. But using the new home button is very different now. And different doesn’t mean good. The old home button always elicited a satisfying click, which is basically gone. The new sensor gives you just a flaccid haptic tap. Unlike the Force Touch sensors on the trackpads of the MacBook and MacBook Pro, the click doesn’t feel natural now. The first few hours with the new home button were the worst, precisely because of that unnatural feeling. I’ve gotten more used to the new button as the days have passed. I don’t love the button, but I do think it prepares us for a future where the button is embedded in the screen. If Apple does remove the bezel home button next year, opting instead to embed it into the bottom of the screen, this sensor could be the path that helps users adjust. The new camera system, on the other hand, is a game changer. The cameras in both devices now have a 28mm f/1.8 lens, which is better in low-light than the old phones. The iPhone 7 also gains optical image stabilization for photo and video. This was a feature that the bigger phones already had, but it’s great to see trickle down into the smaller body. Kiss those shaky shots goodbye. iPhone 6s on left and iPhone 7 on right. The low light performance with the iPhone 7 is a lot better here. Not only is the Samsung 360 more illuminated, there is less noise in the blacks. iPhone 6s on left and iPhone 7 Plus on right. Again, the noise levels in low light are a lot better on the iPhone 7 Plus. You can also see more details on the wall. The lighting through the window on the 7 Plus is a more natural too. The iPhone 7 Plus camera is even more advanced. It has a second 56mm “telephoto” lens, in addition to the standard issue. Pressing a button in the camera app lets you switch between the lenses for instant 2x zoom. It also makes a big difference in the types of shots you can get. In Times Square over the weekend, I was able to zoom in more clearly on lit buildings in the background. On the roof of Gizmodo, we have a great view of the Empire State Building. I can get that much of a closer shot of that building—and the H&M Tower in the background—than I could with a standard iPhone. I expect to see this dual-lens setup on future phones, both from Apple and other smartphone manufacturers—it’s already available on the LG G5—because the it opens the door to so many possibilities. The first cool trick is portrait mode that uses both cameras, but who knows what crazy ideas developers will come up with. If the camera is the hero of the iPhone 7 and iPhone 7 Plus, the most polarizing feature is the loss of the headphone jack. For the legions of people who use the EarPods that come with the iPhone, the change to Lightning won’t impact their life. Apple provides a pair of Lightning EarPods in the box, and completely wireless AirPods will be available in late October. That’s Apple’s real audio frontier, but it’s not quite a reality yet. I’ve spent some time with a pre-production version of AirPods, and while I stand by my initial hands-on, they definitely won’t work for everyone. For the rest of us, Apple includes a Lightning to 3.5mm adaptor. It’s jarring to plug headphones into a Lightning port instead of a 3.5mm jack, and if you’re someone who likes to switch from headphones on your phone to headphones on your laptop, this will take adjustment. The adaptor works. Mostly. I did have a few instances where sound stopped coming out of my headphones and started coming out of my phone, which is both embarrassing and irritating. But getting rid of the headphone jack has its advantages. Not only did it allow Apple to stuff in a slightly larger battery, it also contributes to the new phone’s water-resistance. The iPhone 7 and iPhone 7 Plus are not waterproof—they are rated IP67, which means you can submerge the phone in 1 meter of water for 30 minutes. So if you get tossed in the pool, or drop your phone in the toilet, the device will survive. 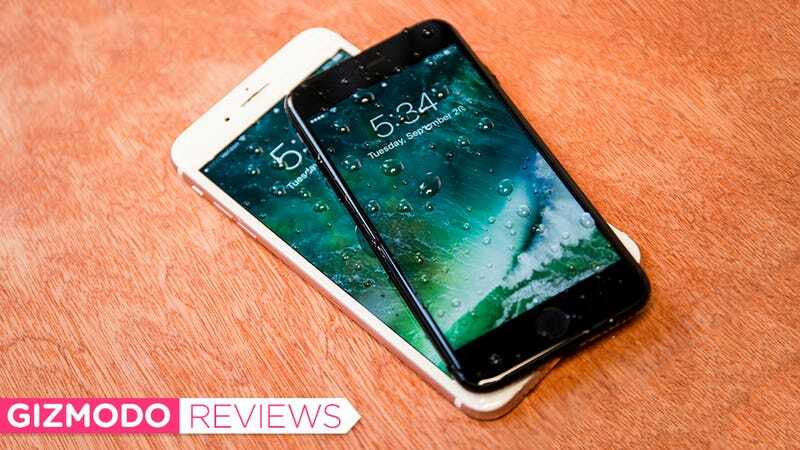 For me, choosing between a more durable phone and a headphone jack is a no-brainer. I’ll take the more durable phone. Like every other iPhone before them, the new iPhones are the fastest ever. The Geekbench 4 scores, which rate the device’s speed and power performance, are impressive, besting even the burly 12.9-inch iPad Pro. Muscle aside, the coolest feature of the new four-core A10 Fusion processor are actually its low-power cores. These are used for simple stuff like fetching background updates from apps, so you’re not wasting battery on horsepower you don’t need. In the end, the iPhone 7 gets two hours more hours of battery than the iPhone 6S. That put me at about 11 hours of all-day heavy use, which is the best battery life I’ve had on a smaller iPhone in years. I got more than 14 hours of battery life from iPhone 7 Plus. Next year’s iPhone is going to be the real bonanza, but the iPhone 7 is helping pave the way to get there. Yet in the present this is still a damn good phone, even if its frankenstein camera and home button that’s not really a button are a little weird. If you’re on an iPhone 6S you don’t need to upgrade but if you have an iPhone 6 or earlier, it’s worth checking out. Jet black finish is beautiful, but it will scuff like nobody’s business. Battery life is fantastic, for an iPhone. The new home button takes adjustment. The cameras are a big upgrade, especially the dual-lens system on the iPhone 7 Plus. The front-facing camera is now 7 megapixels, so it’s even better for selfies. The depth-of-field bokeh trick isn’t ready yet, but should be available in a software update soon. Water resistance on an iPhone. Finally. You will probably lose the 3.5mm to Lightning adaptor that comes with the phone.